Seal the many time breaches that have opened throughout the twisted lands of Rivenspire. Even with all eight fragments of the Staff of Towers collected, time breaches continue to open all across Tamriel. I must seal a new cluster of these rifts in the land of Rivenspire. Talk to Loremaster Celarus in the main hall of Ceporah Tower. Talk to Josajeh and take the Psijic Map of Rivenspire. The map with red crosses on it will lead you to the time breaches to seal them. The map remains in your inventory, under Quest category. Travel back to Artaeum and talk to Loremaster Celarus. Talk to Loremaster Celarus in the main hall of Ceporah Tower to start the quest. What do you need me to do, Loremaster? "Even with the staff fragments removed from Tamriel, time breaches continue to open across the continent. This time, in the forbidding land of Rivenspire. I only pray that they do not grow stronger now that the staff is so close to completion." So you need me to seal more breaches? "We do. As always, the Augur, map and Psijic Seals are prepared for your use. Josajeh will provide them. Return to me once you have closed the breaches. We will solve this problem of the staff soon. You have my word." All right. I'll go speak with Josajeh. You now receive The Augur of the Obscure. Talk to Josajeh. "Ah, welcome back initiate. I can't believe you collected all eight fragments of the staff! I know that we intend to render it inert ... but there's no harm in learning more along the way, right? Now. I hear you're setting out for Rivenspire?" Yes. The Loremaster sent me to collect my gear. "Of course! Do I sound giddy? Sorry. I just never imagined we'd have a chance to actually study the staff! This promises to be very illuminating! At least for now ..."
Are you prepared to let this go when the time comes? "Of course. I mean ... it will probably be some time before we discover the secret of keeping it fragmented, anyway. You still doubt my intentions? I guess that's not surprising. I would not betray the Order, initiate—not even for my family's name." All right. I will see you when I return. "Yes, you will. Safe travels, initiate." 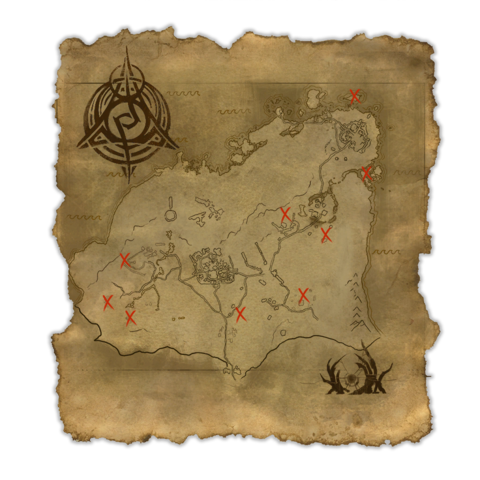 You receive Psijic Map of Rivenspire and 9 Psijic Seals from Josajeh. Examine the map in your inventory. The following table lists the locations of the breaches, and the quotes from the Augur of the Obscure when you get near. Use the Augur when you are near a breach to be able to see it and seal it. Sealing a breach uses one of the Psijic Seals. On the wall west of Trader's Rest (map) Definitely a breach around here, mate. High up, I think .... Or what passes for high around here, anyway. At Sanguine Barrows, between the central tomb and Tribulation Crypt (map) Take a look around those standing stones, eh? What is it with tipping stones, anyway? Didn't your ancestors have anything better to do? That's the problem with you bipeds. You never apply yourselves. In front of the northern tower at Lorkrata Hills (map) Another breach tucked away in an old Breton ruin, right? Can't wait to see what people build on top of this! In a field at Edrald Estate (map) Ah, pastoral bliss! I'd make a fine farmer. Breeding dumb animals, making them work for nothing, slaughtering them in their prime .... Hmm. Sounds a bit worse when you say it out loud, doesn't it? On an island west of East-Rock Landing, north of Orc's Finger Ruins (map) Best find this breach before the tide comes in. Water's full of brain-billies: little spirit-jellies that sting people's memories. Don't believe me? Think of that time you wet your pants. Ha! Hurts, right? In the captain's cabin of Lagra's Pearl (map) Another breach out there. Maybe we should leave this one be, you know? Honestly, what's the worst that could happen? Wait--I'm not encouraging you to ask me that question. The answer is very graphic. In front of the Chapel Crypts at Crestshade (map) Yech. Vampires. Pays to not have a neck sometimes, eh? Blood too, I guess. 'Course if you see any antipodal math-grabbers you'll let me know, right? They'd just love to get a bite of me! Just west of Aesar's Web (map) Breach webbed up around here somewhere. Spiders are so adorable. Look at us! We've got eight little spindly arms--isn't that scary? Show me something with eight thousand arms, then maybe I'll get nervous. Inside Shadowfate Cavern (map) This one's deep, deep down, mate. Kind of like my general expectations of you meat-brains. But you? Oh, you've far exceeded them! Not hard to do when they're practically nonexistent, but still. Kudos! After closing all breaches return to Artaeum and talk to Loremaster Celarus to complete the quest. "Tranquil greetings, initiate. You carry yourself with a victor's confidence. Did you seal the breaches in Rivenspire?" Yes, all the breaches in Rivenspire are sealed. "Excellent. I wish I could echo the sentiment. Our work on the Staff of Towers proceeds at a snail's pace. Every time we make a breakthrough, something interferes. At first, I thought it was the staff itself—expressing some otherworldly intention." After long consideration, I permitted Josajeh to assist me in this endeavor. She was jubilant. But now ... it seems her interest in the artifact remains personal. It brought me no pleasure, but I had to remove her from the project." How did she take the news? "Not well. But she will see the wisdom in it. Avoidance of temptation is a crucial element of moral action. In her heart, she knows this—perhaps better than most. But we digress. You have more than earned this reward. Use it wisely, initiate." I should talk to Josajeh and collect the tools I need to seal these breaches. I should review the map of Time Breaches in Rivenspire and plan my route. I should travel to Rivenspire and seal any time breaches I find there. I sealed all the time breaches in Rivenspire. I should return to Loremaster Celarus and inform him of my success. Finishes quest I should speak with Loremaster Celarus so I can collect my reward. This page was last modified on 21 August 2018, at 17:35.